The romantic tag is one that I did for this past Valentines Day. I made several and this is all I have left. It is done on a thick chipboard tag that measures 6×8 and the wingspan is 12inches. I used Prickley Pear Rubber Stamps to decorate it, and it has lovely beaded fringe on it. I am including an altered domino key chain/pendant that has a soldered edge and a soldered microscope slide pendant. Leave a comment for me and let’s see who I can send this to at the end of the month! OHHHHH so beautiful! I love every piece of it!!!!!! Enter me! Pick me! Hug me!! 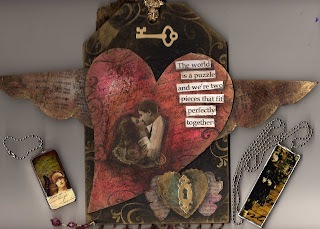 Such a beautiful piece!I would love to have something like this.Lovely giveaway!Please enter me into the contest. I love your work and would be overjoyed to win some of it!